If you’re familiar with my blog you’re already well-aware of my fondness for Russell’s Reserve Single Barrel. From standard retail bottles to private barrel selections, I’m a fan of them all. Why is that? Well, my primary reasons were addressed in a post last year titled “Ten Reasons to Sip Russell’s Reserve Single Barrel.” My intent today isn’t to cover the same ground (after all it is a review), but before moving forward I want to briefly touch on two points – maturity and entry proof. Dusty Wild Turkey can be a wonderful thing. Maybe not every single bottle/expression, but often this is the case (especially if we’re talking Wild Turkey 101 8-year). Folks miss the age-stated 101 – hell, I miss it – but lately I’ve been looking at things from a different perspective. If you recall my Wild Turkey Wish List from a few weeks ago, you’ll note I didn’t wish for 8-year WT 101 (save for a mention on throwback labels). I wished for 101 12-year (man, do I wish for that), but honestly I’m okay with standard 101 not having an age statement. Why is that? Well, I think Russell’s Reserve Single Barrel fills that niche just fine. When folks talk about Russell’s Reserve Single Barrel maturity is often a side note. This is likely the result of the label lacking an age statement. If you do a little research, you’ll find that most Russell’s Reserve SiB’s average nine years of age. Private selections are typically over nine years by a good six months (or more) – some have even reached the ten-year mark. As for standard retail bottles, I’ve heard Eddie Russell remark that they typically fall within an 8-10 year range. Compare this to Wild Turkey 101/8 and on paper you’re looking at similar maturities. Now let’s quickly cover barrel entry proof. Prior to 2004, barrel entry proof for all Wild Turkey whiskey was a long-standing 107 proof. It was changed in 2004 to 110, followed by 115 in 2006. One factor that folks often cite as a reason for dusty WT 101/8’s robust character is the lower barrel entry proof. It only makes sense, as lower barrel entry proof usually means less dilution required to reach standard bottling proof after maturation. In the case of WT 101/8, we’re talking about a 6-point difference from barrel-entry to bottle proof (107 less 101). Now, consider the average age of Russell’s Reserve Single Barrel (nine years) and do the same math. Russell’s Reserve SiB bottled from 2013-2014 will likely have a zero difference from barrel-entry to bottle proof (110 less 110), while the current-issue RRSiB will have only a 5-point difference (115 less 110). 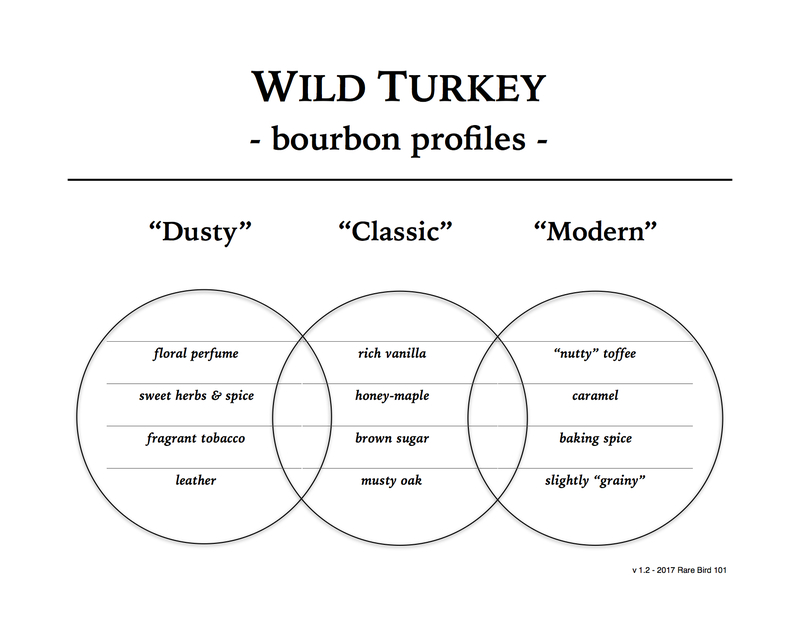 So all things considered, if someone argues that modern Wild Turkey doesn’t compare to dusty Wild Turkey, it’s important to keep these points I’ve covered in mind. Sure, there are other factors to consider as to why dusty WT tastes different – choice wood, cypress tanks vs. steel tanks, “glut era” hyper-aged whiskey, higher urethane levels, etc. But if someone thinks maturity and barrel entry proof are the primary (or only) factors – they’re comparing the wrong expressions. You can’t fairly compare dusty WT 101/8 to modern NAS WT 101 – but – you can compare dusty WT 101/8 to Russell’s Reserve Single Barrel. Are the profiles the same? No. But – more often than not the quality most definitely is. Today’s review is just one of many examples. Overall: There’s something about these early Russell’s Reserve Single Barrel releases that really put a smile on my face. It’s not that they’re better than recent ones. They’re not – at least not generally speaking. Eddie has skillfully dialed-in an incredible profile over the last two years. That said, some of these early bottles can be quite the unique experience. This 2014 Russell’s Reserve SiB is one such experience – full of toffee, french toast, citrus and herbs. It has profile elements reminiscent of Master’s Keep Decades, as well as traits that remind me of late 2000’s and early 2010’s Wild Turkey Kentucky Spirit. It’s flavorful, balanced, and drinks easily below its 110 proof points. If you see these early label Russell’s Reserve bottles on retail shelves, be sure to pick one up. You might just be rewarded with a similar (or even better) sipping experience. And remember the items discussed earlier in this post. You don’t have to find dusty Wild Turkey to discover an amazing pour. To date, all Russell’s Reserve Single Barrel bottles, regardless of label, have just as much (if not more) going for them than 8-year Wild Turkey 101 – especially on paper. You only have to let go of profile expectations, not quality expectations. Cheers! When did the label change occur? Great site!